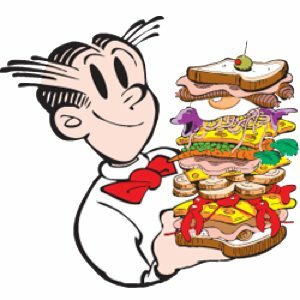 A great many of my restaurant guests have requested these restaurant Sandwich Recipes and other restaurant recipes they have enjoyed ...and keep coming back for! When you think “sandwich,” what comes to mind? Two pieces of bread with some meat jammed in between? 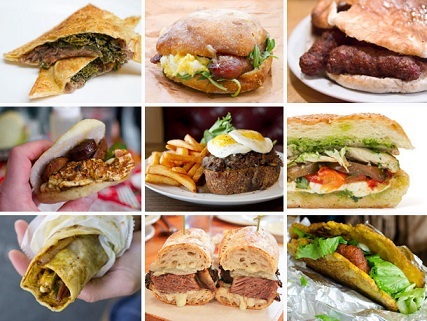 These hot selling restaurant sandwiches ARE WAY MORE than that! 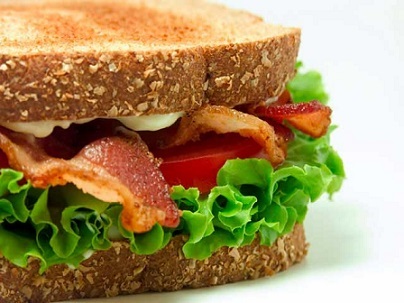 Sandwiches really didn’t “take hold” in America until bakeries started selling pre-sliced bread. Wonder Bread began selling its soft white bread in 1930. 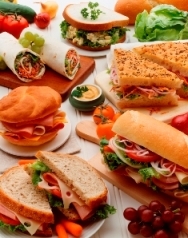 Today Americans are fortunate to have a huge variety of foods available for culinary endeavors and it doesn’t have to be a big deal to make delicious sandwiches for you, your family and your friends to enjoy. Start with a very good meatloaf! The excellent restaurant meatloaf recipe is, of course, included. Preparation time for the meatloaf: 1 1/2 hours. Preparation time for sandwiches: 15 minutes. Servings: 6-8. 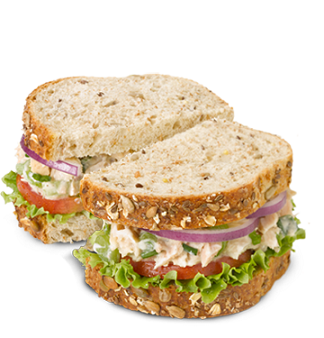 The once secret restaurant recipe for ham salad can be used for sandwiches or salad. Preparation time: 20 minutes. Serves 8-10. Wrapping ingredients in a tortilla became a favorite thing to do as a low carbohydrate alternative to sandwich breads. Preparation time: 20 minutes. Serves 6. There is no more popular a sandwich at my restaurant than the Monte Cristo sandwich. It is a favorite restaurant recipe at breakfast, lunch and dinner. Preparation time: 20 minute. Makes 1 sandwich. These are BIG at the restaurant. The focus is on quality bay shrimp and the combinations of other ingredients used to make this restaurant sandwich a major winner with the guests. Preparation time: 20 minutes. Servings: Cream cheese is enough for 8-10. Looking for a simple, but really yummy fish taco recipe with a white sauce, sometimes called a Baja Sauce? Congratulations - you found it! Preparation time: 15-20 minutes. Makes 12 tacos. Hamburger with a Whiskey BBQ Sauce! This barbecue hamburger restaurant recipe works well anytime, but is one you may use most often during the summer grilling season. Are you tired of the same old recipes you use every summer? Then try this BBQ recipe for your hamburgers. You'll be glad you did. Preparation time: 15 minutes. Serves 4. 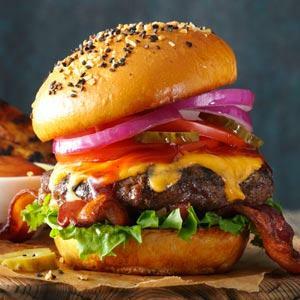 This BBQ hamburger has been voted a best hamburger recipe by my restaurant customers. Preparation time: 20 minutes. Makes 4 BBQ burgers. The Hot Belly Buster Burger! This is one of the best-selling, easy-to-make, wonderfully delicious restaurant sandwiches. Preparation time: 20 minutes. This recipe has an easy option: use turkey! Serves 6-8 depending on portion. There are variations with The Reuben sandwich recipe, including a sister sandwich, the "Rachel," which itself varies regionally. Preparation time: 10 minutes. Serves 1. I first had this vegetable wrap at a restaurant in Tucson, Arizona when I was on vacation (a rare occurrence). Preparation time: 12 minutes. Serves 1-2. An example of the cultural and regional influences on our eating habits nation-wide. Roasted red peppers and Pepper Jack cheese ...you get the idea! Preparation time: 15 minutes. Serves 4. A good cup of soup might be a great addition to any of these sandwich recipes. Click here to view some wonderful restaurant soup recipes. Thank you for finding the website. Thanks, too, for your interest in restaurant sandwich recipes that work! You can cook with confidence and style! ENJOY your restaurant sandwich recipes and the company of those you share them with! Did you know? The use of some kind of bread to lie under and over some other food, or used to scoop up and enclose or wrap some other type of food, long predates the 1700's (the Earl of Sandwich), and is found in numerous much older cultures worldwide.